Seattle’s mass transit line offers ease of commute but homeowners and buyers are feeling the pressure. 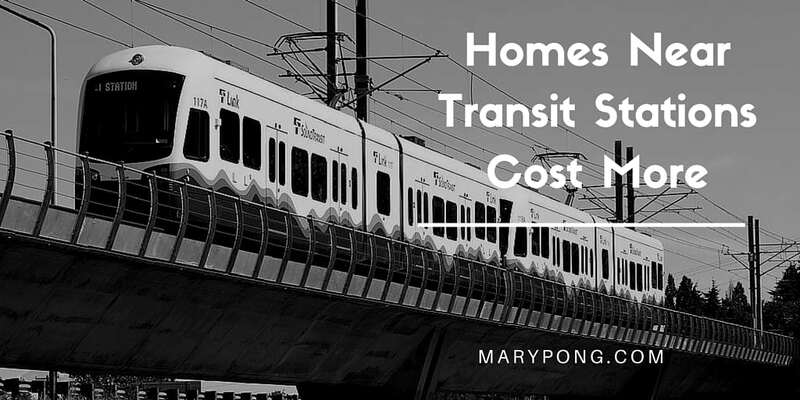 Homes tend to cost more around the Puget Sound’s massive transit expansion, especially near stations. Seattle has been expanding the transit line for years throughout the region but if you want to live with the convenience of hopping on the train to work, it may cost extra. A local research firm calculated the data from the median cost of a home near a Link lite rail station and compared it with the median cost of a home elsewhere in the area. Results unequivocally showed that homes near stations paid thousands more simply due to the fact that they are closer. The station at Capitol Hill showed that homes were selling $35,000 more than similar homes, not close to the station. The same goes for the Beacon Hill station coming in at over $60,000 more and Pioneer Square boosted an impressive $78,000 more for similar homes not close to a station. New stations are popping up on the Eastside as well and homes are already selling higher simply because of the fact that a station will be built. Prices are roughly $50,000-$75,000 higher near projected stations around Bellevue. As traffic increases, demands for homes near stations will also increase, raising prices even more. With millennials looking to ditch their cars for a more economical and environmentally friendly alternative, these prices will continue to rise and demand will be even greater. People may want to live farther out of the city but living near stations may negate the savings of not living in the city. While many outsiders want to avoid traffic and use mass transit, they may be paying the price somewhere regardless of where they “think” they are saving money. Cities are already planning for stations and transit villages near them over the next 10 years and prices are already affecting this. Expansions are in the works from West Seattle to Ballard, Issaquah to Tacoma and Everett. However, there is great news for land and homeowners already near a station or projected station; higher selling prices and better values for their existing properties. Also, Seattle hasn’t seen the same added cost premium as other cities for homes along the rail line. So far, our train line is not as useful as other places with larger and more expansive lines. That should dramatically change over the next two decades. For now, most of the increase is in the Seattle central area but prices in outlying areas like Lynnwood and Kent should start to catch up in the next 10 years. But, for those looking ahead, buying in these areas now is probably one of the surest bets you can make. Are you interested in homes that are near projected stations? Call Mary Pong now for a complete list of homes properties in your search area.